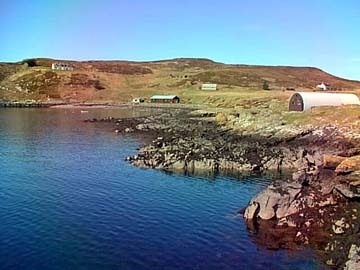 Tanera Mor is the largest and only inhabited island of the group of islands known as 'The Summer Isles'. Tanera Mor lies 1.5 miles offshore from Achiltibuie in the mouth of Loch Broom on the Coigach peninsula in the county of Ross-Shire. Like so many of the small Islands around Scotland Tanera Mor's history goes back to early Viking raids and beyond. In more recent times Murdoch Morrison of Stornoway was appointed as manager of the newly founded fishing station in 1784. 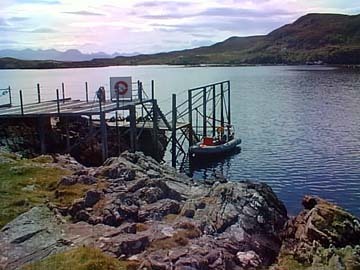 As with the stations on Isle Martin and Isles Ristol it was built by the London based British Fishery Society. It was a very prosperous enterprise while the herring stocks lasted. Up to 200 vessels at a time would anchor in the bay and salted herring was even exported as far afield as the West Indies. After the fishing spree was over in around 1820 there followed a period of many changes of ownership and greedy tacksmen demanding high rents. Therefore the islanders took up the distillation of illicit whiskey !! In 1900 anothr lucrative sideline was introduced when the island was acquired by Captain MacDonald, a local smuggler. Today there is a salmon farm based in the bay, and in the summer sailing boats find shelter on their West Coast wanderings. 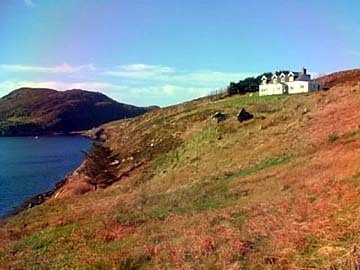 The holiday cottages lie in the north side of the bay with spectacular views of the hills on the mainland. Frank Fraser Darling wrote a couple of books based on his time on Tanera Mor during the war years. The books are called Island Farm and Island Years but unless you know someone with a copy you'll probably be struggling to find them. As ever please contact Lonely-Isles if you know of any books you think would be of interest and we'll add them to the site.e. The Summer Isles - Official site for the Summer Isles which of course include Tanera Mor. Plenty of local information as well as a good selection of photographs of this isolated and sparsely populated island. Undiscovered Scotland - If planning a trip to the Summer Isles you'll first need to get to Achiltibuie. It's not an easy place to get to but this page from the always excellent Undiscovered Scotland site will tell you all you need to know. Coigach - Web page all about the Coigach Peninsula where the Summer Isles are to be found.